Hobble on the Cobbles is set to rock Aylesbury town centre again this summer, the third consecutive annual free live music festival, which has now become a very popular and regular attraction in the Aylesbury calendar. 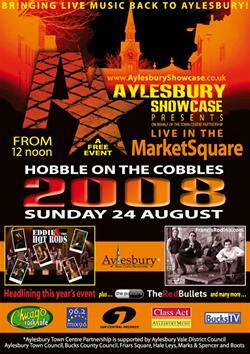 Organised once again by Aylesbury Showcase on behalf of the Aylesbury Town Centre Partnership, the Hobble on the Cobbles will be held on bank holiday Sunday, 24 August 2008 from 12 noon. This year, thHobble on the Cobbles will also be raising funds for WheelPower and will coincide with the Olympic handover ceremony in Beijing and local celebrations in Aylesbury and at Stoke Mandeville Stadium. Following on from John Otway, and Fish, this summer sees classic rockers Eddie & The Hot Rods headline the main stage, this year sponsored by Chicago Rock Café Aylesbury. With three hit albums and four top-forty UK hit singles, including the top-ten hit “Do Anything You Wanna Do”, these rockers will certainly put on a great show and it really will be another fantastic day out for the residents and music fans of Aylesbury”. Headlining the second stage – (known this year as the Mix96 stage) is Francis Rodino, a born New Yorker, who loves his Italian heritage. (Francis's family re-located to Italy when he was 10 years old). Although classical music was at the heart of his education, (he studied at the prestigious Verdi Conservatory of Milan, acquiring his Grade 8 British Associated Board of Music Exams in Cello with Distinction), popular song-writing called him from an early age. Influenced by the rock n' roll classics of the 50's, Francis picked up his Dad's old nylon stringed guitar which had been gathering dust for far too long. It was an instant, natural, and ultimately life-long bond of love. Since moving to London in 1993, Francis has been performing regularly on the London circuit. From intimate acoustic sessions through to prime venues like the Barfly and the Clapham Grand, Francis has developed an ever increasing, and loyal fanbase. In November 2007, Francis became the 2nd UK-based artist to achieve a $50,000 album budget through the groundbreaking new concept SellAband, a website and music label where music lovers around the world connect and invest money in future albums of independent artists. Having already pre-sold 5000 copies of his debut studio album "Circles & Squares" through the SellAband website, Francis Rodino is releasing his unique brand of catchy, intense, contemporary pop-rock onto the scene. "I wanted to create a sound of my own: intense, intimate, provoking, meaningful. I write about how I feel about life, love, losses and failures, highs and lows, and broken hearts. This album represents experiences that we all live through; trying to fit in, trying to make sense out of what may happen randomly. I try to tell stories through my music that is accessible to different people, from different walks of life." His debut album, "Circles & Squares" is due out shortly. (Available at Amazon.co.uk, iTunes and all reliable media outlets) and was produced by Steve Bush (Sterophonics, Corrine Bailey Rae). Hobble on the Cobbles has become Buckinghamshire’s largest all-day free live music festival, and caters for a wide range of musical styles and genres to suit all tastes from heavy rock to acoustic pop. Also performing at Hobble on the Cobbles 2008 will be Buckingham bands ‘The Swamis’, ‘The Red Bullets’, and ‘Dave Easter’, Watford acoustic trio ‘Navaro’, Oxford artist ‘Juliana Meyer’ and Luton band ‘Loz Jones’. Loz Jones, who earlier this year wrote and released the song “Bring The Ducks Home”, the new football anthem for Aylesbury United Football Club, will also be performing the single on the main stage, with a few special guests! In addition to that are rising stars ‘Slashed Seat Affair’, (who have been described as “one of this year’s most hotly tipped global recording artists”) plus ‘The Heathers’, and the very popular Aylesbury band ‘The Powders’ – who have just released their second album “Warm” – (which is now available to buy on iTunes). Once again, Hobble on the Cobbles has a third stage, which is exclusively for ‘cover-bands’, and this year is sponsored by He’e Nalu and headlined by popular local band ‘Charlie Don’t Surf’. Also appearing with ‘Charlie Don’t Surf’, is ‘Abakus’, ‘The Observers’, and backed by popular demand ‘The Brahmas’, who add a bit of soul to this rock line-up. “We have literally been inundated again this year from bands from all over the UK who wish to perform at this event, which is absolutely fantastic as it shows Hobble on the Cobbles is growing in popularity and that it’s a cool festival to play. In 2006, we had Scouting For Girls perform for us at Hobble on the Cobbles, just before they hit the ‘big time’, and last year King Rat (who exclusively performed at our aftershow party) have supported The Feeling, having won ‘most popular band’ in a national competition. New bands to watch out for this year – to name but three, are ‘Slashed Seat Affair’, ‘The Red Bullets’ and ’Francis Rodino’, and we are really pleased and proud to have secured such an amazing line-up for this year’s festival”. “Shortlisting the bands from the hundreds of applications has been very difficult, but we are confident we have something for everyone, and still being able to showcase and support a number of local bands at this event is very important to us”. “We are very excited to have ‘Eddie & The Hot Rods’ performing and headlining this year. This will work especially well as we’ve also arranged for The Chopper Club to put on a display of 300 of the best custom made motorcycles – a real treat for all motorbike enthusiasts. The top floor of the Civic Centre Car Park has been reserved to cater for the display, so will be closed (for parking) to the general public all day. The public are of course welcome to come along to meet the owners, take photographs, and take advantage of this unique opportunity to view some of the best custom designed and built motorcycles from across Europe”. The festival will start at 12 noon and run till 7pm. An aftershow party has been arranged at Chicago Rock Café, where Aylesbury favourite ‘Lisa Theunissen’ will perform a selection of tracks from her new album along with a number of party favourites. A ‘school disco’ will follow till 2am to keep the Hobble on the Cobbles party going into the early hours. WheelPower provides accessible facilities at the local Stoke Mandeville Stadium, the “home of Wheelchair Sport” including an Athletics Arena, Sports Hall, Indoor Bowls Centre, Swimming Pool and Fitness Centre. Each year many thousands of men, women and children become disabled due to an accident or illness. WheelPower is the national charity for wheelchair sport and helps these people and many others with disabilities to achieve their sporting dreams. Anneka Rice and Gerry Sutcliffe MP, the Minister of Sport launched the Wheel Appeal and challenged the nation to raise enough money to provide sports wheelchair for young disabled athletes by 2012. The Appeal aims to raise £6-million, enough money to provide over two thousand sports wheelchairs to disabled children and young adults by the time the Paralympics return ‘home’ in August 2012. The Aylesbury Showcase team felt this fitting, as not only is 24 August 2008 the official handover day from the Beijing Olympics to London, for 2012, this also support a local charity and local athletes.